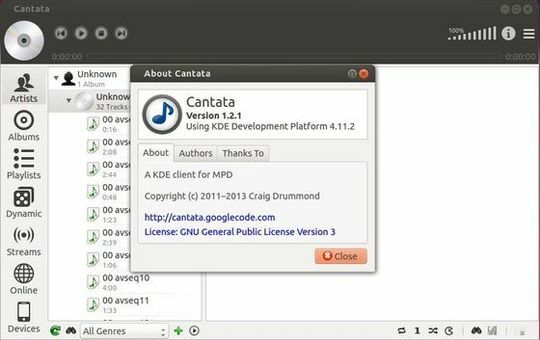 Cantata, yet another client for music player daemon now is at 1.2.1. This release brings a few improvements and bug fixes. Use “(c)” instead of “©”, as “©” seems to mess up Qt translations. Fix tagtype and URL handler detection. Fixes Composer support, and streams. Use 32×32 for drag’n’drop icon, 64×64 for highdpi. Use audio-x-generic icon for drag’n’drop if no cover found. Fix potential memory leak with cover images. Fix crash when changing online view from list to tree, after a soundcloud search. Use MPD status.playlistLength to determine number of playqueue items when controlling state of prev, next, and stop buttons. I’ve made this release into PPA for Ubuntu 14.04 Trusty, Ubuntu 13.10 Saucy, Ubuntu 13.0 Raring, Linux Mint and their derivatives to make it easy to install.